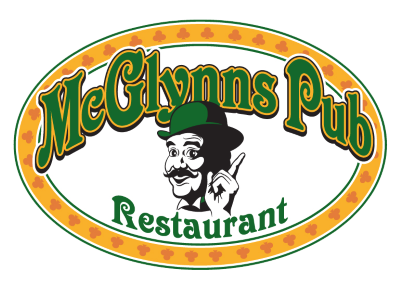 McGlynns is a favorite place to grab a quick bite to eat or spend the whole evening socializing with friends. The wrap-around bar makes it easy to talk to the bartenders and keeps things interesting. We put out consistently good food in a fun atmosphere and all for a great price. McGlynns menu includes our famous burgers, steaks, and roast beef sandwiches along with southwestern dishes, and dinner specials. An array of 50 kinds of beer and free happy hour buffet always makes McGlynns The Place To Be. Just about any sports game can be viewed on over 18 TVs. Or, try your hand at the interactive NTN trivia game. McGlynns relaxed atmosphere is a smoke free environment, it includes an out-door deck for the warm months and a cozy brick fireplace for the colder months. Our banquet room facilities can hold private parties up to 40 people. A strong management team, the area's best bartenders and friendliest wait staff all contribute to McGlynns' success. Come into McGlynns and see for yourself why we have been voted Delaware's Favorite Neighborhood Restaurant.